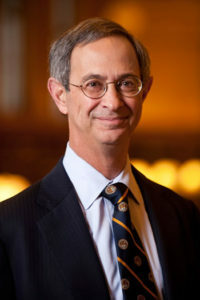 Joel Seligman, G. Robert Witmer, Jr. University Professor, oversaw one of the most transformational periods in the University’s modern history. As president and CEO, he led a successful $1.37 billion comprehensive fundraising campaign, an initiative that helped support more than two dozen new facilities and major infrastructure projects. Other significant accomplishments include increasing student enrollment by 40 percent, expanding the number of faculty positions throughout the University, and growing the University’s clinical enterprise to a 15-county network anchored by six hospitals. Implementing a strategic planning process, Seligman encouraged new academic initiatives in data science, neuroscience, the humanities and performing arts, and other areas. During President Jackson’s administration, the University realized a number of significant developments, including the integration of River Campus programs into the College of Arts, Sciences, and Engineering; decentralization of the University’s principal divisions; implementation of the nationally noted Renaissance Plan, providing a significant improvement in the quality of the College’s student population; revitalization of the Medical Center as a nationally recognized center for patient care and research; and distinctive curricular innovations throughout the University. President O’Brien’s administration saw the opening of a number of important facilities, including the Computer Studies Building with its Carlson Library, and Schlegel Hall on the River Campus; the new Sibley Library, Eastman Student Living Center, and Cominsky Tower at the Eastman School of Music; a major addition to the Memorial Art Gallery, and the beginning of a major addition to the Medical Center complex. Robert Sproull served as the seventh President of the University from 1970 to 1984 and as chief executive from 1975 to 1984. A physicist, he came to Rochester from Cornell University as our provost in 1968. His administration saw the University maintain its programs and even grow in significant ways during what was generally a difficult period for American higher education. Two very popular buildings opened during President Sproull’s administration—Wilson Commons, replacing Todd Union as the student union, and Zornow Center, greatly enlarging the athletic facilities. W. Allen Wallis came to the University from the Graduate School of Business at the University of Chicago to serve as our sixth president from 1962 to 1970, and as Chancellor from 1970 to 1978. His administration saw the expansion of the University’s programs and facilities and the unsettled campus conditions of a nation torn by the Vietnam conflict. Cornelis de Kiewiet’s years at Rochester saw a number of changes, including the merger of the undergraduate campuses and the creation of three new colleges: Education (now the Margaret Warner School of Education and Human Development) Engineering (now the School of Engineering and Applied Sciences), and Business Administration (now the William E. Simon Graduate School of Business Administration). De Kiewiet and his twin brother were born in the Netherlands, but were brought up and educated in South Africa. De Kiewiet was keenly aware of the wrongness of apartheid and lectured and wrote against it. Alan Valentine (1901-1980), our youngest president at age thirty-four, came to Rochester from Yale University in 1935. His fifteen-year administration saw the final years of the great depression, the many stresses and dislocations of the Second World War, and the surging enrollment that greatly taxed University facilities after the War. According to George Eastman’s will, the Eastman House was left to the University, to be used as the home of UR presidents. President and Mrs. Rush Rhees lived there from 1932 to 1935. Alan Valentine was in residence with his family from 1935 to 1948, when the House was established as an International Museum of Photography. Rush Rhees (1860-1939) came to the University in 1900—we had been without a president for four years—and was the second of our presidents to serve thirty-five years. The decade of the 1920s was pivotal in the evolution of the University from what was essentially a college to a true University. In 1920, the campus consisted of the buildings on the Prince Street Campus. By late 1921, the die had been cast: the School of Music was under construction, the Medical Center was well into the planning stages, and the Board of Trustees had voted to keep the Prince Street Campus for the College of Women and build a new campus for the College for Men on the site of the Oak Hill Country Club. David Jayne Hill came to the presidency of the University of Rochester from the Presidency of the University of Lewisburg (now Bucknell University) in 1889 and served until 1896. His comparatively brief administration saw the weakening of the University’s ties to the Baptist Church and the liberalization of the curriculum. In October, 1891, University leaders and other influential Rochester citizens gathered at the home of Susan B. Anthony to honor Elizabeth Cady Stanton. Much criticism was voiced on the University’s continuing policy of not admitting women. President Hill, who had just become the father of twins—a girl and a boy—remarked that “if the Creator could risk placing sexes in such near relations…they might with safety walk on the same campus and pursue the same curriculum together.” Despite Hill’s blessing on co-education, it was another nine years before women were admitted to the University. Martin Brewer Anderson (1815-1890) became the first president of the University in 1853 and served until 1888. His starting salary was $1,800 per year. In 1861 he oversaw the University’s move to what later became known as the Prince Street Campus. At the time of his retirement in 1888, the University had three buildings and 172 students.